While the Syrian government massacres its revolting peasants, I see that US Vogue has still yet to take down its recent ghastly and fawning interview with Asma al-Assad, Syria's 'dynamic first lady' who is on a 'mission to create a beacon of culture and secularism.' She should import the BBC's resident proselytising atheist Prof Brian Cox to help her out." Now the fabled Washington Post has just caught up to speed, 12 months after Madame Arcati's scoop. Two days ago we asked who was the famous brother of the person in the snap we published. 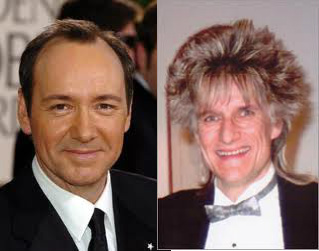 The answer was Kevin Spacey. The pic was of his older brother Randy Fowler who runs the Rod's Limo Hire company in Boise Idaho.